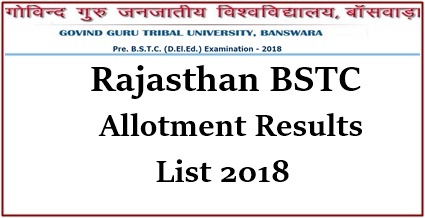 BSTC Third Round Allotment Results List 2018 : Rajasthan GGTU Released BSTC 3rd allotment Letter results College Wise today on 18th August. The GGTU has earlier scheduled to release the second allotment results on 7th aug. Candidates those who are waiting can Download BSTC Allotment list from BSTC ggtu official website, bstcggtu2018.com. Check Below Article For More Details. The Guru Gobind Tribal University annually conducts the Basic School Training Certificate (BSTC) entrance exam for aspirants seeking admission into 2 years D.EI.Ed course. Annually a huge number of aspirants attempt this examination to get admission in GGTU. Candidates, those have got merit in this examination will get admission in the course. This year nearly 6.5 lakh aspirants competed for BSTC Entrance Test which has been conducted on may 6th. This Examination has been held in 1273 examination centres across Rajasthan. 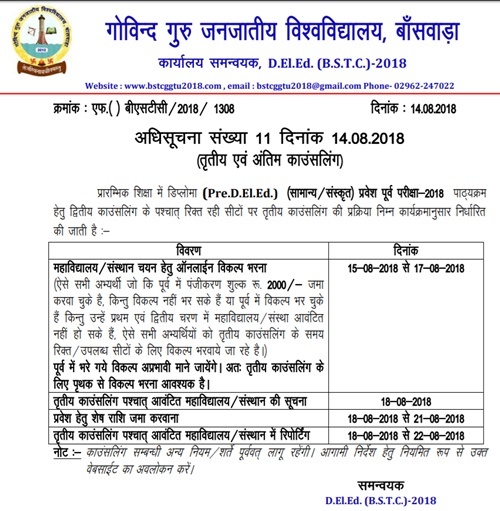 The GGTU has announced the BSTC results on 3rd June and the University has announced the counselling Schedule dates for admissions. The BSTC allotment based on the entrance exam results is held for admission to Diploma in Elementary Education (D.El.Ed.) course in the Teacher Training Institutes in Rajasthan. The GGTU has 312 colleges working under it. The colleges hold more than 20,000 seats. In which 16 Colleges offer 1220 seats for Sanskrit course and 4 colleges offers alp bhasha course. The GGTU counselling was done and all the seats were filled by the candidates on the basis of choices. The seat allotment will be done as per the marks, and category of candidates. The BSTC counselling was completed from 02nd to 5th August 2018. Till 5th August, the students seeking admission have filled their choices. The ggtu will be announced that the BSTC Second college allotment results 2018 to check from 7th August. Candidates those who get the admission can report to the corresponding colleges by 10th August (last date). Candidates have to download the BSTC seat allotment order and have to report to the colleges along with the allotment order. Also, candidates need to carry the printout of bank challan copy and have to pay the remaining fee at ICICI branch. Initially, candidates need to complete the fee payment process then they have to report to the corresponding college. Candidates need to carry the required documents, education certificates, domicile certificate, category certificate, registration fee and balance fee payment, printed copy of application form, and allotment order. Also, students need to carry two self-attested copies of documents along with two passport size photographs. Students have to pay the fee From 23rd June to 29th June 2018 and have to report to the colleges by 6th July. The additional 2 days 9th to 11th July will be given for aspirants for upward movement in College allotment. 355 no.mera 3rd list me nahi aaya aage chance hai kya…. .. ?